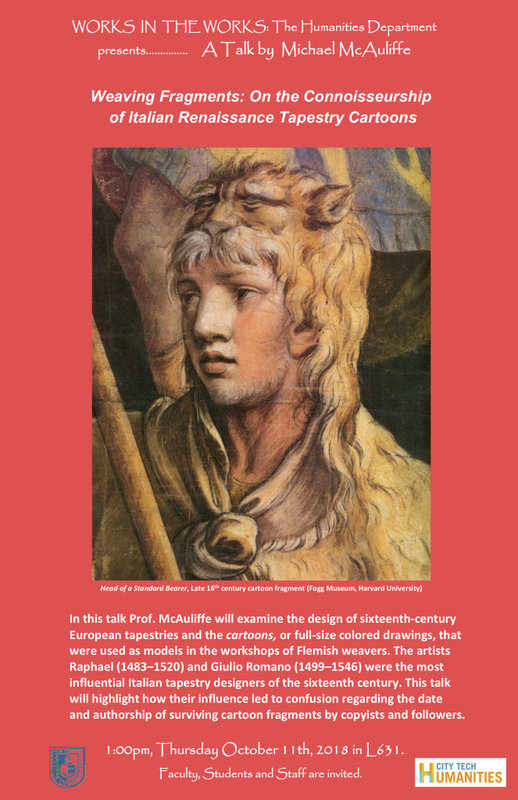 In this talk Prof. McAuliffe will examine the design of sixteenth-century European tapestries and the cartoons, or full-size colored drawings, that were used as models in the workshops of Flemish weavers. The artists Raphael (1483–1520) and Giulio Romano (1499–1546) were the most influential Italian tapestry designers of the sixteenth century. This talk will highlight how their influence led to confusion regarding the date and authorship of surviving cartoon fragments by copyists and followers. Faculty, Students and Staff are invited. Refreshments served.